Bowmore Tempest V is a cask-strength testament that there are still craftsmen alive and well in the big Whiskey houses along the moors. Islay is special. For centuries, all they had was the local barley, clear spring water, cut and dried peat to heat their homes, and the sea … always there was the sea. If you take all that and wring it into a barrel, you get Bowmore … a Whisky spirit that clings to the memory of the barley, the peat, and the sea. The Bowmore Tempest editions are limited release, small-batch issues. They get a good bit of extra care and consideration, not the least of which is that they get the best wood to age in—first fill ex-Bourbon. So All of the Tempest editions get a greater share of the sweetness and vanilla esters that come with those barrels. Bowmore issues one Tempest each year, and this one is batch number 5. And since this is small-batch stuff, there are differences you can taste. The Tempest editions are served up at cask strength, and each ABV is a little different (a fun little quirk). Tempest 5 is 55.9%, so hang on to your britches. Better yet, add a healthy splash of water. Another difference this year is that issue 5 is richer than last year’s. Why? Who knows, and God bless ‘em that is just the way it should be with a small-batch dram! Bowmore Tempest V is definitely an Islay single-malt, so the peat is there, but in a kinder-gentler way, so you will find it approachable and savory on the tongue. Enjoy it you salty dog! 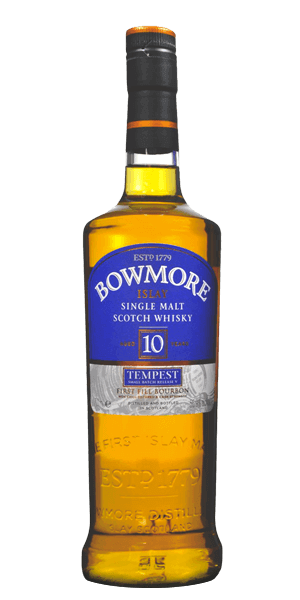 What does Bowmore Tempest 10 YO Batch 5 taste like? The Flavor Spiral™ shows the most common flavors that you'll taste in Bowmore Tempest 10 YO Batch 5 and gives you a chance to have a taste of it before actually tasting it. Perfect balance between smoky and strong whilst still tasting smooth. Love it! A real cracker! Sweet vanilla and heavy peat smoke on the nose. The arrival is intense, sweet and salty. Loads of smoky vanilla sugar, some floral character, thinking violet, on the development. The finish is long and lingering with sweet peat smoke, cracked black pepper and vanilla rock. Hard to find this kind of quality for such affordable price.